Since graduating from the University of Southern Queensland with a Bachelor of Visual Arts (Hons) in 2009, Alex Stalling has held numerous solo exhibition, curated shows, directed galleries, taught regular workshops with a focus on extra curricular student classes at the Toowoomba Art Society, sat on various committees, presented and represented at various conferences, and has created public artworks across South East Queensland with a focus on Toowoomba. In 2009 Stalling coordinated the Crows Nest Regional Art Gallery in South East Queensland. In 2011 Stalling and fellow artist Elysha Gould established made. Creative Space Toowoomba an Artist-Run Initiative which offers exhibition, workshops, consultancy, creative event management, professional development, an international residency program and advocacy for regional arts practices. In her own practice Stalling has exhibited internationally in Bristol UK, New Zealand and the USA. Her work has been acquired by local government galleries and commissioned across South East Queensland. In 2012 Stalling designed and created the work for the Toowoomba Carnival of Flowers public art project Play Me I’m Yours as well as a commission for an Ergon Energy Transformer. In 2013 Stalling and Gould presented at Articulate: Queensland Regional Arts and Culture Conference on Creative Tanks: Promoting local artists and businesses through micro-residencies and cultural tourism. As part of the Toowoomba Carnival of Flowers she coordinated the 3 year of Creative Tanks and the public art project Real People Real Stories. In collaboration with Artslink QLD and Toowoomba Regional Council Stalling with the Community Coordinator for the 2013 initiative Animating Spaces Toowoomba. Alex is available for professional development workshops, curation and co-ordination of exhibitions, artistic events and festivals, as well as exhibitions and commissions. Graduart Catalogue 2007, USQ Printery, Toowoomba. 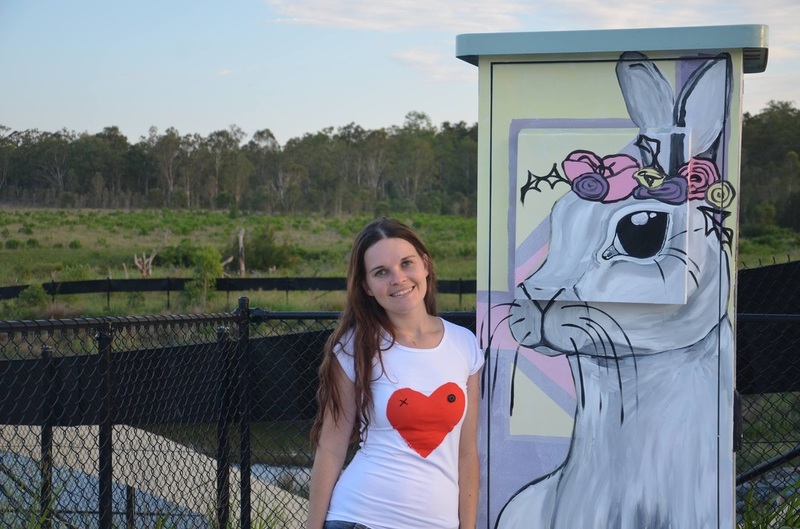 13 January 2011, The Gympie Times, Animals help artist keep sane.